Welcome to the official web site of the Ryukyu Kobujutsu Association Great Britain. This site has been developed to support you in your training and study of authentic Bujutsu, providing information on the origins and history of the Association, its role and activities, and details of the training ethos, methodolgy and grading requirements. 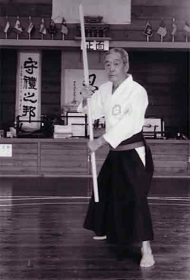 The RKAGB works to preserve and promote the teachings of the late Grand Master Motokatsu Inoue. From beginners to senior students, the Association provides a structure in both weapon evolution and grading, providing the link for all serious martial artists between open hands and weapons. The Association was formed by Sensei Julian Mead, following his return to the UK after 6 years of study in Japan, where he trained under Motokatsu Inoue at the Honbu dojo in Shimizu. Through the various courses and training programmes offered by the RKAGB these teachings are now passed on to students all over the world. The RKAGB offers the student of martial arts a unique and traditional system, backed with expert and qualified instruction. Regular courses are held throughout the U.K and internationally. In recent years the interest and passion in this classical Martial Art has grown rapidly. The syllabus and structured teaching allow students to develop a deep understanding of the traditional ways of Kobujutsu. Students are able to fulfil their potential, achieving a level of high technical skill, whilst developing their strength, both mentally and physically. This is paramount to the true study of Bujutsu and emphasised in every training session. Open hand Karate forms part of the Ryukyu Kobujutsu system, providing a fuller understanding of Bujutsu.